Twenty years after riots sparked by the Rodney King verdict tore Los Angeles, Harry Bosch finds himself revisiting the scars of the past. His city’s and his own. Two decades before, the determined detective had to abandon a crime scene, and the broken body of a young Scandinavian journalist, in the maelstrom of racial division-spawned violence sweeping the City of Angels. Now, a ballistics match provides the aging Bosch with a second chance to find justice. The possibility the murder wasn’t random riot violence opens up a Pandora’s box for Bosch and his politically motivated police masters however, as the anniversary of the riots loom and racial tensions bubble. Can the dogged investigator survive as he sifts through the morass, trying to dodge those who want the past to remain buried, and live his long-held mantra: “everybody counts, or nobody counts”? Connelly is a modern-day master of crime writing, a gold standard of the genre. An adroit chronicler of contemporary Los Angeles - its people, places, and issues - whose tales entwine intriguing character studies, page-turning plotlines, and the challenges facing individuals and society. 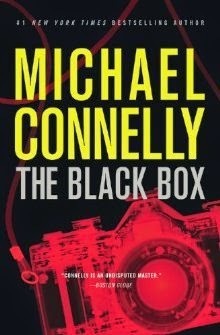 THE BLACK BOX is another rock-solid instalment in arguably the best detective series of our era.